The world lost an amazing soul this past Wednesday. Our good friend Matt Doust sadly passed away after suffering a fatal epileptic seizure. He had just completed work on his debut U.S. solo show and the family has requested we carry on with the show as a celebration of Matt’s life and all the amazing work he left us with to remember him by. An accomplished portraitist, Doust’s hyperrealistic paintings explore the concept of identity through the external betrayals of the body. The artist’s dramatic human landscapes tap into the subtle revelations of physical expression, drawing the viewer’s attention to the subject’s minutest details. At times voyeuristic, these larger than life portraits are both alienating and intimate. Undeniably beautiful, they seem haunted and resonate with a provocative sense of discomfort. Doust draws on our anxiety and fascination when faced with the other in this unfamiliar proximity and scale, forcing monumental disclosures of intimacy upon us. The paintings convey a sense of irreconcilable distances: those between the familiar and the alien, the self and the other – and yet do so somehow by uniting this sense of estrangement with a feeling of intimacy. While portraiture is ostensibly a study of the objective subject, Doust reveals that it is as much about the artist’s selective disclosure, and the viewer’s projections, as it is about the internal lives of those exposed. The artist’s haunting portraits remain evasive alloys of the seen and the unknown, and seem to instigate an interminable longing in the viewer to “possess” the inner motivations of the elusive sitters. These portraits reveal something of the desire for sameness, and this desire’s coexistence with the estrangement of manifest difference, in our shared search for human connection. 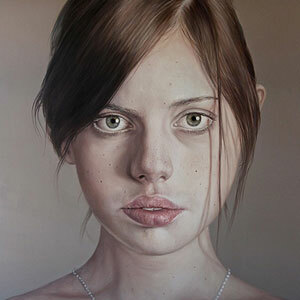 Matt Doust captured the fleeting and intangible impressions of identity, those we read from the body, and immortalizes them in portraiture. The artist’s ability to arrest the beautiful and the strange simultaneously, and his appreciation of imperfect perfection, results in portraits that are as much about absentia as they are about what is manifest. Upon seeing Doust’s paintings, we are strangely cognizant of the failure of our own holistic impressions, and of our inability to capture the “truth” of the other. Perhaps the work’s subtle melancholy comes from this realization of our own covetous disappointment: the subject is always slightly beyond our grasp. These portraits provide us with a rare opportunity to slowly excavate the intimacies of the body: searching for some sense of “truth”, communion, or revelation in the flesh. Doust captured what stirs beneath the skins of his subjects. With great technical facility, and a genuinely unparalleled refinement and detail, he was able to animate an inanimate surface with an evasive internal life.